We all know it's a great idea to ride a bike, but most of us find it impractical, too. I love that this bike, although not exactly stylish, banishes some of those excuses. It's not exactly the easiest to store a huge bike in your little cubicle at work, but tucking this away into its compact form 'is' easy. And while you might be encouraged to ride bike to work, just how practical is that for a lot of you? Instead, tuck this into your trunk and maybe ride to lunch instead. 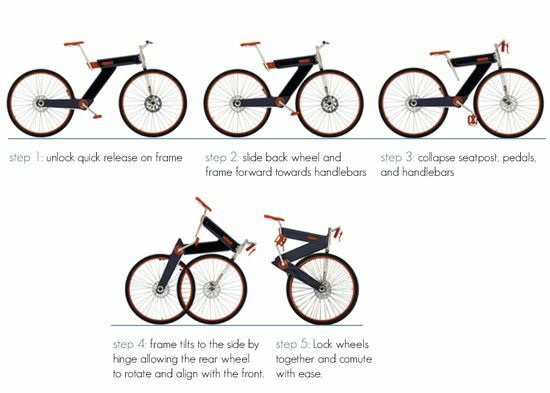 This compact foldable bike is the best of both worlds.....better for your health and the environment without going off the deep-end of inconvenience. Then again, it's probably too cold to be riding much this winter no matter how convenient this bike makes it. Too cold for sure, but VERY nice.